£125+ 20% VAT per month [Total £150 per month]. Plus possible contribution to Council Tax (£25 per month). NB Full-time students are exempt from Council Tax. 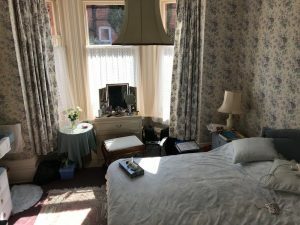 A friendly older person with limited mobility is seeking a Sharer for their home to give them a mix of 15 hours’ help and company each week in exchange for the low-cost accommodation. This person would really benefit from some friendly company, the reassurance of someone living with them, and practical help around the house including cooking some meals, drawing curtains, making hot drinks, taking our bins, and general help. The person does have a cleaner and gardener. The accommodation on offeris a large furnished room, with a single bed and shared use of the bathroom (bath, no shower). The property is conveniently located in a central location just a 10 minute walk from Bournemouth Station, and very close to the hospital. The person enjoys conversation, reading the newspaper, watching TV and reading. The ideal Sharer will be a friendly and reliable female, non-smoker who will be happy to give the agreed help and company in exchange for the low cost accommodation.